Easily Track Important Vehicles and Assets with this Covert Hardwired GPS Tracker! 2.4" x 4.0" x 1.0"
Q. How easy is it to install this GPS tracking device? The XT-100 has a simple 3-wire installation, and can be completed in under 30 minutes. Q. Where is the ideal place to install my XT-100? The ideal location is with the tracker mounted on the dashboard with a clear view through the windshield, however you can experiment with different locations (such as under the dash) to determine which gives you the optimum placement. Q. How is the GPS tracker powered? It is powered by your vehicle's power battery, so that you'll always have constant power, and never have any batteries to worry about charging. Q. Can I view the tracking info from my smartphone? Yes you can - in addition to viewing from any PC or Mac, you can also use your favorite smartphone to view live tracking data. Q. How often does the tracking data update? By default the tracker updates its position every 10 seconds, much quicker than most other trackers that update every 1 to 5 MINUTES. There are no contracts or service agreements. Service is month to month and can be cancelled at any time. You can even re-activate your device later if you wish (a re-activation fee will apply). Q. Can I test out the GPS tracking interface? Yes you can - we offer a live demo - just click on the button on the product page to try out the tracking interface and get familiar with the system. Q. What are tracking "alerts"? You can set up several different type of alerts (where you'll get an email or text message). 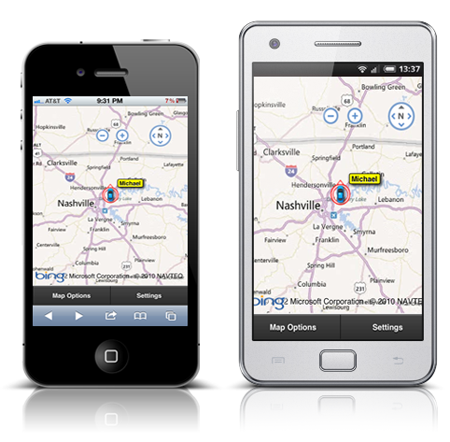 You can get speed alerts, geo-fence alerts, and even get alerted if your vehicle deviates from a pre-set route. Q. Can multiple people view the live tracking information at once? Yes they can - if you need multiple people (such as different employees at a company) who need to view the same tracking data at once, they can simply log in to the tracking portal with the same username and password. Q. How can I cancel my service? If you need to cancel your service for any reason, just call our GPS service line by the 25th of the month with your account username and password. The XT-100 is a live GPS tracking device that offers the fastest update speeds on the market. And with it's hardwired operation, it's perfectly suited for tracking fleet vehicles. The tracker is powered by the vehicle's battery, so there are never any batteries to charge. With the XT-100 hardwired tracker, you can monitor your vehicle's location in real time - updated every 1, 5, or 10 seconds - faster than any other GPS tracker. 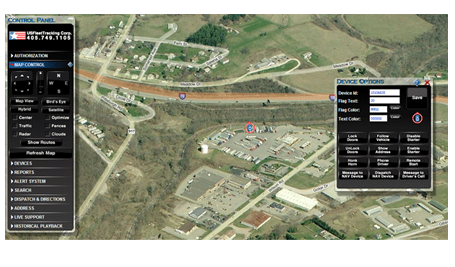 View your live GPS data on our live tracking portal, which you can view on any internet-connected computer or device. Everything is web-based so there's no software to install. The tracking portal will let you set up real-time SMS text and email alerts, geo-fences, run historical reports, view up to 90 days of historical playback, and track up to 3000 vehicles under a single account. No other GPS system can give you all these features. With the XT-100 you will get UNLIMITED tracking updates for only $29.95/month. The XT-100 is a hardwired tracker, so it requires a 3-wire installation to connect it to your vehicle for power. Installation takes less than 15 minutes, and you'll never have any battery life concerns to worry about. The GPS tracking portal is web-based, so there's no software to install. Log in from any internet-connected computer or device with your username and password to view your live tracking information. Some trackers claim to have "live" tracking, but only provide location updates every 1 to 5 MINUTES. A lot can happen in that time. With the XT-100 you can get 1, 5, or 10 SECOND updates - the fastest on the market. 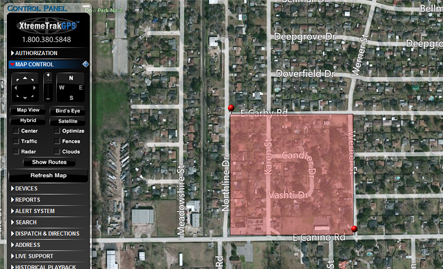 Our easy to use tracking portal allows you to set up pre-determiend "geo fence" zones. This will allow you to get instant alerts every time a vehicle enters or leaves one of these zones. You can also run historical reports to see every time the vehicle has entered or left the zone in the last 90 days. 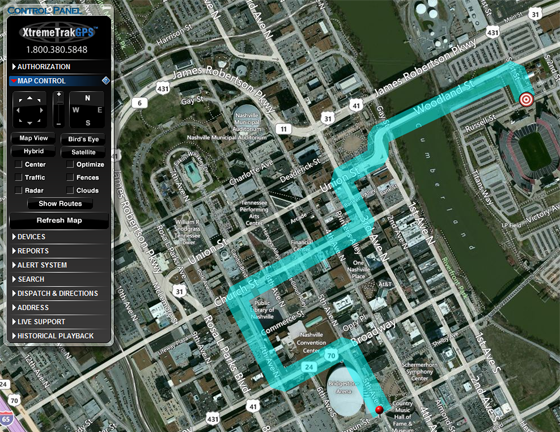 With our Route Planner tool, you can create specified routes for drivers to follow (such as a daily delivery route). Combined with our alert system, you can get instant alerts if the driver deviates from the predetermined route. Set unlimited email or SMS text alerts so you get notified instantly when a vehicle exceeds a certain speed, deviates from a route, or enters/leaves a pre-determined geo-fence zone. In addition to logging in on your computer (PC or Mac), you can view your live tracking information from any smartphone - such as the iPhone, Blackberry, or Android devices. Also use your favorite tablet device - just log in with your username and password. Your last 90 days of GPS data is automatically saved, so even if you didn't see it happen live, you can go back and see where a vehicle was at up to 3 months ago at the push of a button. Use the printable reporting feature to create custom reports about vehicle driving history from the last 3 months. Download the data to your computer, or easily email it in Excel or PDF format. Unlike many GPS trackers that lock you into a contract, our GPS service is month to month, and you can cancel at any time.